Courtney’s Story | Kids F.U.N. In 2010 I spent 3 months in India, working for a nonprofit providing professional development workshops for teachers focused on curriculum integration. We conducted Skype conversations with 5th graders here in Jacksonville. When they asked things like “So, do you guys all ride around on elephants?” and “Have you ever heard of Christmas?”, I realized the lack of exposure to international culture kids receive in our education system. We decided to make videos to share with each other the differences between living in Jacksonville, Florida and Bandhavgarh, India. When the 5th graders of Jacksonville were asked what they wanted to talk about, they answered “skinny jeans and ipods”. After their teacher explained that the Bandhavgarh kids had no electricity, running water, or even shoes on their feet, they decided to talk about something a little more meaningful. The kids were so deeply moved that they initiated a project to collect and send shoes! This experience made me understand that if kids can simply be exposed to life in other parts of the world, they will be intrinsically motivated to create positive change. Hence the birth of Kids’ Foundation for Uniting Nations (Kids’ FUN), with the mission to create a global network of kids who inspire each other to initiate positive change. 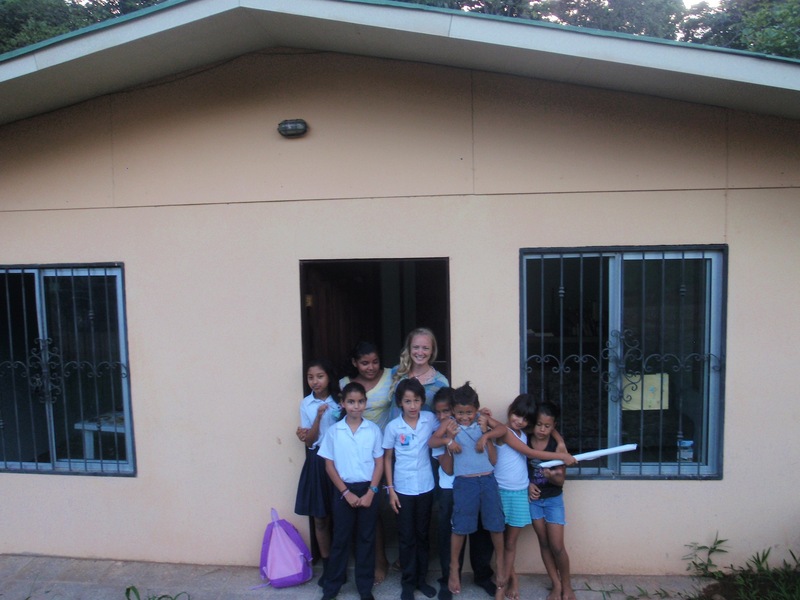 I began the project in Uvita, Costa Rica for 2 reasons. First, I had the opportunity to visit Costa Rica when I was 13 years old and met a boy my age who had already had to quit school and work to support his family. It made me feel so fortunate to be growing up in a circumstance that allowed me to complete my education. Second, I had visited Uvita a few times and was familiar with the issues facing kids in that area. I moved to Uvita in 2011 and began by connecting the Escuela la Uvita English class with a class in Jacksonville via Skype. I met a 7 year old girl with epilepsy named Naomi. Her teachers told her parents that she would never be able to read and write. As a teacher, I saw something different. I saw a very intelligent, vibrant little girl who, with the right kind of support, could go far in life. If someone believed in her. So I did. I mentioned to a friend the idea to open an after school program to help kids with homework and offer English classes. The next thing I knew I was putting a deposit down on the little house across from Escuela la Uvita. We did a fundraiser which paid for 3 months of rent. Then we did another, and another. In 2013 we were fortunate to be recognized by the U.S. Embassy as a project worthy of grant funding for drug prevention. Since then we have grown so much and evolved into a foundation aimed at benefiting the well-being of children and adolescents in Costa Ballena through educational, artistic and recreational activities; giving them the opportunity to choose to be responsible, respectful, and independent with a high quality of life. We do this through educational programs including Drug Prevention, Environmental Education, Community Mentoring, Integrated Education, Homework Help and Recreation. We also teach technology, language skills and encourage an attitude of continued learning. Our values ​​are responsibility, respect and solidarity. We have 55 students enrolled, and are open Monday through Friday from 9:30 am to 4:00 pm. On weekends we go hiking, take educational tours and participate in sports activties. Participation is free for all local kids. We project our light to the community by informing and raising awareness on the rights of children, the consequences of drug use and the importance of a healthy lifestyle. We carry out garbage collection projects, reforestation, gardening for families and recreational activities.